On that note, it's time for me to bid you a fond farewell. Thanks for your contributions today... especially your recommendations for Alan Irvine songs (81 mins). I'm off to listen to some Marvin Gaye/Guns N' Roses! Night. Here's a sobering stat for Burnley supporters... the Clarets have now gone 8 hours & 46 minutes without a Premier League goal. Remember when they signed Ian Wright? Before then, however, MOTD 2 pundit Kevin Kilbane will be writing a column for this very website where he will analyse this afternoon's game at The Hawthorns. Look out for that later this evening. If you missed today's goals, or indeed need to catch up on Saturday's action, be sure to watch Match of the Day 2 this evening. The show is on BBC One in England, Wales and Northern Ireland at 22:30, while it's slightly later at 23:25 in Scotland. Craig Gardner: "Booooooom! What a result. We were all class today including the fans #boingboing #3points buzzzzzzzzing." Ann Williamson: Lukas Jutkiewicz did OK at Bolton last season and I think we are missing him but he and Marvin Sordell are Championship at best. Not good enough for the Premier League. Can the Baggies keep their boing? It becomes slightly trickier for West Brom, who travel to Liverpool next weekend before successive home games against Manchester United and a resurgent Crystal Palace. What next for Burnley? Well, they visit Leicester City next weekend before back-to-back home games against West Ham and Everton. Surely they'll be targeting six points out of nine to kick-start their stuttering season? More from Burnley manager Sean Dyche, speaking to BBC Sport: "It was a good performance from them and a poor one from ourselves. The biggest learning curve in the Premier League is that you cannot turn up and not be right on top of your performance. We are growing into it and it is important we turn up ready to perform. We did not look right today. Today we looked unsure from the beginning. "Maybe the changes affected that, our midfield has played a big part for us and we had two players missing. But that is why it is important to have a squad. You have to come in and deliver with purpose and that was lacking today. WBA deserved it. Full credit to them. We knew the first goal was going to be important and after that there was no coming back." West Brom manager Alan Irvine on BBC Sport: "Saido Berahino can be very good. He's a terrific lad and very, very talented. I spoke to him at half-time and said to be patient and continue making runs. He got his reward for continuing to do that. He's a model professional and has fantastic potential." Barry Mc Donnell: Burnley need Danny Ings and Sam Vokes fit as soon as possible. Starting to really feel for them. Mark Riley: As a Burnley fan all I can say is that was an embarrassing performance!! Matt Barnsley: A hard working team can get you places in the Championship. And I'm not convinced the quality of the league last year was great. Leicester were the only top top team last year. And they're currently holding their own. West Brom manager Alan Irvine, speaking to Sky Sports: "We were terrific. You can never be 100% satisfied and there was a little spell in the second half I did not like but only five or six minutes. The rest of the time I was delighted. "It is bred from the work we have been doing and the way the players have applied themselves since day one. A few weeks ago I said we were closer to where we wanted to be. There is still work to do and tough games to come but it has been a great week and the players have got their reward. "I believe we have got a great group of lads but I also know how hard it is going to be to win games in this league. We will not get carried away. We have had a good start, and we have to build on that." Burnley manager Sean Dyche: "We never got started and never got to grips. It's important we grow and learn from it. Yes (it's our toughest day in the league). We had changes forced upon us, but it's important we deal with the changes. There were two horrible set-pieces from our point of view. You want players that come in to grip the shirt - I don't think we did that today, it'll come another day. We gave the ball away silly today." Chelsea to play at Twickenham? about playing at Twickenham while Stamford Bridge is redeveloped. The Rugby Football Union has confirmed it has been in contact with the Premier League club but said talks are at a very early stage. Twickenham is the home of English rugby union and the 82,000-capacity stadium has never hosted a football match. The RFU said: "We have had an enquiry from Chelsea FC but have not had any discussions of any substance." Mamadou Sakho has apologised for making "a bad choice" by leaving Anfield before the Merseyside derby against Everton. The French international, 24, was left out of the squad and was pictured by a supporter heading out of the stadium. "I'm aware it was a bad choice from my part," Sakho wrote on his Facebook page. We'll bring you manager reaction from The Hawthorns shortly, but let me first tell you about a few football stories making the news this Sunday tea-time. Here are a few key stats from this afternoon's one-sided clash at The Hawthorns. James: I wonder how furious Liverpool fans would have been before the start of the season if you'd told them that after six matches they'd be beneath Palace, Leicester and West Brom in the table. Secondly, the players which epitomise this West Brom team of recent years - the likes of Graham Dorrans, Chris Brunt and James Morrison in midfield - all imposed themselves on the contest. They overran Burnley in the centre of the park. Two things struck me about West Brom today. Firstly, the impact of some of Alan Irvine's new boys - left-back Sebastien Pocognoli laid the platform for success with his marauding runs down the flank while Cristian Gamboa picked up an assist when he came on as a late substitute. In the centre of defence, Joleon Lescott was an absolute colossus. West Brom midfielder Chris Brunt: "We have good self belief and confidence to win games - we showed that today. The manager (Alan Irvine) has come in and got us organised and playing in the right way. We have a big squad of players and a good team spirit. From the start of this season we've been right on it." West Brom forward Saido Berahino, speaking to Sky Sports: "We were on it from the start. It just shows how good this group is. I just try to do my best, I managed to contribute with a couple of goals and I felt good. We have stuck together throughout this period and our results are paying off. We have to focus on Liverpool away now and make sure we get something there. But it has been a great week. Three wins." Quality stuff from the Baggies then, who move up to 10th in the table, above both Liverpool and Everton to name but two. "The referee calls full-time to save Burnley any more embarrassment. Albion played well. Burnley and Sean Dyche will be disappointed not just with the scoreline but the opportunities they did not take and most of all the way Albion dominated the midfield. Burnley were second best from start to finish. They are going to find life difficult in the Premier League." Matthew Calloway: WBA looking good at the moment, despite a slow start. Like the new Baggies team. Mark Stott: Newcastle fans will be cheering that one! Off the bottom! West Brom's perfect afternoon - a dominant performance against a Burnley side who slump to the bottom of the Premier League table. "Good running off the ball and the pace of Cristian Gamboa made that goal. The pass was good, and he cut Burnley right open. "A 4-0 scoreline tells the story of the match. Burnley could have had goals in the second half, things have maybe not gone for them, but since the first goal they have been on the back foot." Lovely stuff from the Baggies, who make it four when Georgios Samaras plays a neat ball down the right for Cristian Gamboa who pulls the ball back for Graham Dorrans and the Scottish midfielder drills home a low shot. Ben Mee's miserable afternoon is complete as he goes into the book for tugging at Graham Dorrans's shirt. Craig Gardner departs the action to rapturous applause, to be replaced by Claudio Yacob. "There has been very little come through from Burnley in midfield. That has been the biggest disappointment for me. I know they have problems up front but there has been no build-up play today." Two shots which encapsulate Burnley's afternoon - George Boyd's effort is charged down and Michael Kightly's follow-up sails harmlessly over the bar. West Brom make a change at full-back as Sebastien Pocognoli comes off for Cristian Gamboa. Alexander Fox: Alan Irvine songs: 'Sweet Child Irvine' - Guns N Roses. 'Irvine Superman' - Donovan. 'Heard It On The Irvine' - Marvin Gaye. 'Canary In An Irvine' - The Police. Good work, Alexander. Now let's get one of those songs echoing round The Hawthorns. West Brom are running Burnley ragged now - Graham Dorrans driving into the penalty area and pushing back Ben Mee before unfurling a shot which finds the side-netting. West Brom manager Alan Irvine decides it's time to save Stephane Sessegnon for future battles, sending on Georgios Samaras in his place. Martin McHugh: Each goal West Brom score now will lift them a position in the table. The Baggies, in 11th place as it stands, can move into seventh above Manchester United with four more goals. I feel like I'm kicking them while they are down, but Burnley are now bottom of the Premier League following that third West Brom goal. It's interesting to compare the different attire of the two fledgling Premier League managers. West Brom boss Alan Irvine has plumped for the tracksuit look, while Sean Dyche is in pristine white shirt and club tie. He could have arrived at the game straight from a Christening. "Lukas Jutkiewicz's header was the first real test Ben Foster has had and Burnley's first effort on goal - after 66 minutes. Jutkiewicz has worked hard, and the fans have given him a round of applause for his effort. I thought Burnley would have signed few more players in the summer. They should have dug a little bit deeper if the aim is to try and stay in the Premier League." Better from Burnley as Marvin Sordell gets in behind the Baggies backline and picks out Ashley Barnes, but the striker blazes over. A final roll of the dice from Sean Dyche... Marvin Sordell replacing Lukas Jutkiewicz up front for the Clarets. Finally Burnley register an effort on goal - Lukas Jutkiewicz bringing a brilliant, almost point-blank, save out of Ben Foster with a header from Kieran Trippier's deep cross from the right. Darius Ikanyon: No disrespect to West Brom but is this the same Burnley side that Man Utd couldn't win against? Sarah Morgan: Burnley's struggle in the Premier League is like Cardiff's last season. Proving too much of gap has opened up between top two tiers. When Chris Burnt is showboating down by the corner flag with 25 minutes to go, you know you've got the three points in the bag. "It does not look like there is any way back now for Burnley. One goal can change things, but Sean Dyche doesn't have many options left. Alan Irvine is comparatively new to the managing game but he has a team who are experienced in the Premier League. And today West Brom have been too much for Burnley." ... Saido Berahino steps up for his hat-trick, but dinks it straight into the wall. West Brom fans sing 'der, der, der, Alan, Alan Irvine'. There must be a better ditty they can manage than that. Any suggestions? 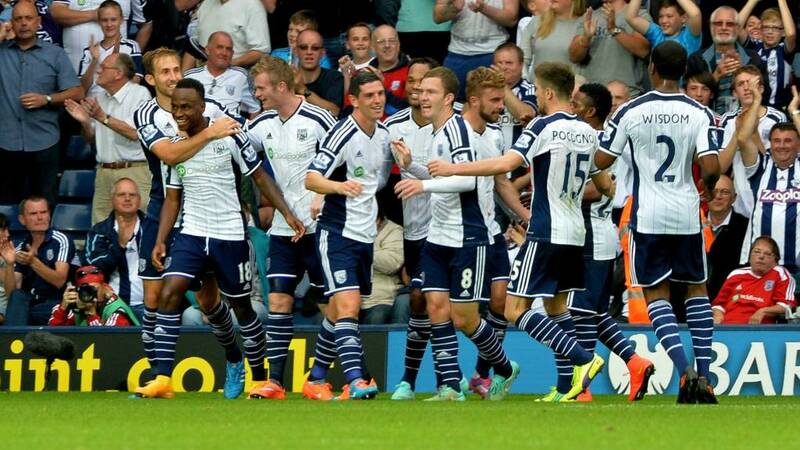 The Baggies are enjoying themselves now. "Burnley were caught there. The ball was played into Saido Berahino between Jason Shackell and Michael Duff and Berahino had too much pace for them. He thumped it with his right foot and Tom Heaton was not going to save that. It is a long way back for Burnley now." West Brom part the Burnley defence like a hot knife through butter - Graham Dorrans being found in space 40 yards from goal and playing a perfect pass through to Saido Berahino who angles his shot across Tom Heaton and into the back of the net. The boy can finish. Sebastien Pocognoli has continued where he left off in the first half and he stands up a perfect cross to the back stick where Ben Mee does well to charge down Stephane Sessegnon's effort. Joleon Lescott realises West Brom need a bit more impetus and drives forward with the ball from the back, passes to Saido Berahino and when the ball breaks for Craig Gardner, a vicious shot flashes wide. Soccer Pundit: I've got the feeling the Baggies aren't through yet. Two or three more goals would surely finish the game. Anthony Shaw: I honestly can't see Burnley winning a game this season, never mind staying up! Agubata Odinaka: It's obvious academy youth product Saido Berahino will finish above record signing Brown Ideye on the scorers chart come May. West Brom are building patiently from the back, but that lack of urgency almost costs them when Burnley win the ball back and striker Ashley Barnes ends up being closed down in a dangerous area. Nathaniel Chalobah's first action in Premier League football? A yellow card for a wild lunge at Craig Gardner. That's not even a booking in the Championship (see Danny Guthrie's challenge earlier today, 46 mins in the Reading v Wolves game). "Sean Dyche has obviously got to do something because Burnley ended that first half with their heads down. I cannot remember Ben Foster making a save. It looks like they will go to a 4-4-2 with Ashley Barnes joining Lukas Jutkiewicz up front." We're back under way with two new faces in the Burnley side - Ashley Barnes and Clarets debutant Nathaniel Chalobah replacing Steven Reid and Ross Wallace. Bob: Burnley struggling against West Brom which is no surprise really. They made the Premier League but have no class! Elliot Edwards: The more goals the Baggies score the better! However, why are they all from corners? Ten-man Inter Milan suffered their first defeat of the Serie A season with a surprising 4-1 defeat against bottom side Cagliari. Albin Ekdal, who had scored three in 77 appearances for the Sardinian side, doubled his tally for the club with a 15-minute hat-trick. Inter captain Yuto Nagatomo was sent off in the 27th minute after picking up a second yellow card, while Nemanja Vidic conceded a penalty which was missed. Fierce city rivals AC Milan also had a man sent off in their 1-1 draw at Cesena. Davide Succi scored the opener before Adil Rami headed in the equaliser. Cristian Zapata was sent off in the 73rd minute for denying Gregoire Defrel a clear scoring opportunity. "Burnley have to show a bit more endeavour and ambition. The balance is not quite the way Sean Dyche would have wanted, and perhaps that is because of the resources he has, but they have to go forward a little bit more in the second half." "It's an uphill task for Burnley in the second half. Craig Dawson, the man they wanted to sign in the summer, scored and then Saido Berahino made it 2-0. West Brom in a commanding position." To concede once from a corner is bad, to do so twice is almost criminal in the Premier League. James Morrison's centre from the left is flicked on at the near post by Graham Dorrans and Saido Berahino steps away from his marker to head home from six yards at the back stick. Adam Gibson: On this showing if Burnley stay up this season it will be nothing short of a miracle. We're asking you to send us suggestions for a team made up of footballers who share names with other famous people. Ryan, Canterbury: Former Norwich striker and current Slayer and Exodus guitarist Gary Holt. Graham Dorrans looks to have steel in his boots as he picks up the ball in space, advances forward and then lets fly from 35 yards with a powerful effort which is tipped over by Tom Heaton. Chris Brunt is scheming away in midfield for West Brom and a long-range effort flies over the bar. "There is a bit of frustration creeping in from Burnley. They are used to having a bit more of the ball in that central area and at half-time Sean Dyche has to tell his midfielders to provide more support for Lukas Jutkiewicz. He is up there as lone ranger, and in the Premier League that is very difficult. "There is very little going towards Ben Foster's goal. All the pressure is on Burnley." Again West Brom load up an attack down the left and the ball eventually breaks for Craig Gardner on the edge of the area but the midfielder's powerful shot shaves the head of Steven Reid on its way out of play for a corner, which comes to nothing. West Brom are buzzing about the pitch now, and Chris Brunt plays the perfect ball into space for Saido Berahino but the young striker checks his run and the split-second indecision sees the move break down. Rabin: Scrappy goal, well deserved. Let's see how the ginger Mourinho reacts after conceding. "There was a mass of bodies in the way but I thought the goalkeeper might have come for that. Craig Dawson's header was well inside the six-yard box. I think somebody did touch it before it went in but Dawson will claim the goal. The weight of pressure has told for Albion." remember that lad you tried to sign in the summer?Craig Dawson? Well, he's just scored against you... rising above Jason Shackell at the back stick to head home Chris Brunt's corner from six yards out. Mike Flint: Leg of lamb and Yorkshire pudding? Are you out of your mind? Better from the Baggies, as a corner evades everyone but is picked up by Craig Gardner near the opposite flag and the midfielder cuts back inside where his angled shot is almost deflected in at Tom Heaton's near post. "When you're playing against a well organised defence, what you have to do is break their rhythm. You have to start running off the ball to make them manoeuvre around a little bit as well. "Albion are standing square with the Burnley defence. They need to draw them out but haven't shown enough movement so far." West Brom's Sebastien Pocognoli is trying to get forward as much as possible down the left, but he runs into Kieran Trippier's excellent tackle. Sven wasn't wrong (5 mins). Minutes later, the full-back does get a cross away but the ball sails over everyone and away to safety. It's alright... you can go and check on that leg of lamb in the oven. We'll shout you if anything happens. Save us a Yorkshire pudding. Matthew Bennett: Fulham striker Matt Smith and Dr Who's Matt Smith. Both travel in space well, and the striker may consider his move if he could time travel. Burnley waste a chance to register an effort on goal when Kieran Trippier fires a free-kick straight into the Baggies wall. This game needs a spark. Simple but effective build-up play by West Brom. A throw-in is cleverly controlled by Stephane Sessegnon, who spins his marker and plays a pass through for Saido Berahino but the striker drags his shot wide. Jonathan Dacey: Jonathan Davies rugby pundit, current rugby player and Korn front man? Can anyone get a fourth? "Chris Brunt has a terrific left foot. His shot went across the box and caught the Burnley defender Michael Duff. The Burnley defence so far have been pretty composed, but that could easily have found the net. "Saido Berahino is on his own up front for Albion, with Stephane Sessegnon almost a free agent. And both teams seem to have set up with the same style." A long, raking Hollywood ball from Burnley's Steven Reid picks out Ross Wallace, who sloppily gifts possession back to the Baggies and the home side break. The pacy attack ends with Chris Brunt's deflected shot almost finding its way in at the near post via Michael Duff's touch. Burnley's wait for their first goal since the opening weekend of the season goes on as Michael Kightly hooks a shot over the bar. Neither side is displaying a touch of class in front of goal at the moment. Jonathan Willlet: One of the men currently on the pitch at the Hawthorns, James Morrison. Can pick a pass and hold a tune. The distinct, gravelly tones of Burnley manager Sean Dyche bellow instructions from the sidelines. If the Clarets boss ever finds himself out of work, he'd be a great darts referee. "One hundred and eighty..."
Gareth, Watford: How about these three Brazilian footballers? Socrates, Bismarck and Gladstone. Greek Philosopher, German leader and British Prime Minister. "From what I have seen of WBA this season, I like Stephane Sessegnon coming from a bit deeper than where he used to play at Sunderland. Saido Berahino has a real chance. He is playing up front, but he can play across the whole front line." Burnley's Kieran Trippier was highly rated by Sven-Goran Eriksson as a teenager at Manchester City, and the youngster almost plays in Lukas Jutkiewicz twice - the striker spinning Craig Dawson on both occasions. West Brom set the early tempo, and the Burnley defence has to be alert to clear Chris Brunt's searching cross from the left. The Baggies are really pressing their visitors back. "This is the kind of game Burnley need to get points from if they are to stay up. They have looked strong at the back but lightweight up front. It has given Sean Dyche a real problem and the season has only just started for them. Getting that first victory is very important. The same thing could have been said of WBA seven days ago but they have had a good week, with two wins." We're up and running at a sun-drenched Hawthorns. The two teams make their way onto the pitch at The Hawthorns, which is 'boing-ing' ahead of kick-off. Always one of the better ground for atmospheres. Fred Holker: Jimmy Carter- former Liverpool/Arsenal winger and former US president? West Brom on Twitter: Steven Reid's name got a warm reception from Albion fans when read out. Here come the Burnley supporters, who will likely recognise West Brom as one of their team's bogey sides - the Clarets have not beaten West Brom at The Hawthorns since December 1969. Burnley manager Sean Dyche speaking to Sky Sports: "We've had limited time to work with the team because the changes we've made are all late changes. But the players that have come in are all looking forward to it. We are looking to perform week in week out and build on our performances." West Brom manager Alan Irvine, speaking to Sky Sports: "It would have been very difficult to change the team after the win against Tottenham. The response from the players has been fantastic and it's obviously been great to get two wins in the last few days. Now the aim is to get back-to-back Premier League wins." Aaron Webster: Robbie Williams the footballer, snooker player and the singer. Kamran Manzur: Adam Clayton - Boro player/ U2 Bassist. Richard Wilkinson: Inverness Caledonian Thistle's Nick Ross and the BBC's former Crimewatch presenter. West Brom will be looking to young striker Saido Berahino for goals this afternoon, and the 21-year-old says he is feeling good about his game after hitting "rock bottom" last season. "I felt alone," reflected Berahino. "There was no-one I could go to in the club and get advice from. "Things have changed as last season I don't think the seniors knew who I was. Now we've got that relationship, they understand me and I understand them. "You mature quicker, playing a man's game, you have the senior lads that help you along with it as well. I would say maybe I learned that the harsh way last season. But I don't regret any of it, it's made me who I am now so I just look forward." "Burnley will try to do what West Brom did when they won at Tottenham last week. They'll sit off and try to be defensively well organised. The onus is on West Brom and that's a different mindset to last week." Burnley: Only five clubs have recorded four goalless draws in a row in the top flight, including West Brom in 1983. Will the Clarets make it six clubs? Their last three matches have all ended goalless and with both Burnley and West Brom managing just four league goals between them this season, the chances of another 0-0 must be high. "West Brom played quite well at Tottenham last week. They had 11 new players this summer - the most of any side. Manager Alan Irvine has had to try to mould them. I saw little signs of recovery last week. They've been described as a yo-yo club, but this is their fifth consecutive season in the top flight." What should we expect from this game then? Well, Burnley will be just hoping to get on the scoresheet - they have failed to net in their last five matches. As for West Brom, they are beginning to find some form after a shaky start and they will expect to register another three points today. Jordan Thornberry: James Brown, striker at Gateshead, shares his name with the singer. Pingo Rock: Does former Barnet defender (Craig) Pope count? More from Reading manager Nigel Adkins, speaking to Sky Sports: "We are going to score goals, but we have to have better control of the football. (We can achieve that) by working hard on the training ground. "We have players coming back like Danny Guthrie, and it was important for him today. We played against a good side in Wolves. Give them a lot of credit. There is a very positive mood around the club, Hope Akpan has just been called up to the Nigeria team. And I thought it was a good game of football." Reading manager Nigel Adkins, speaking to Sky Sports: "We have played against a good side in Wolves. They are good in possession and had only conceded three goals this season. We didn't have control of the game, and they probably had too much. For me we responded well to get back in the game having gone behind. Credit to the players." West Brom, seeking back-to-back Premier League wins for the first time in a year, are unchanged from the side that started last Sunday's 1-0 win at Tottenham. Former Baggies defender Steven Reid starts for Burnley, one of three changes to the side that drew 0-0 with Sunderland last time out. Midfielders Ross Wallace and Michael Kightly also start, with Dean Marney, David Jones and Marvin Sordell making way. West Brom: Foster, Wisdom, Lescott, Dawson, Pocognoli, Dorrans, Morrison, Gardner, Brunt, Sessegnon, Berahino. Subs: Myhill, Gamboa, McAuley, Yacob, Mulumbu, Blanco, Samaras. Burnley: Heaton; Trippier, Shackell, Duff, Mee; Arfield, Wallace, Reid, Kightly; Boyd; Jutkiewicz. Subs: Gilks, Chalobah, Sordell, Barnes, Ward, Keane, Long. "This is a game that West Brom will be expected to win, and if they do, it will be a victory of the type that can help avoid the nervous dramas they experienced at the end of last season. "Burnley, though, will look at West Brom's recent home league record that shows only two wins in this calendar year, and arrive at The Hawthorns with hopes high they can get their first win back in the big time. "They've already shown they will be well organised and have a solid foundation but have really struggled in front of goal. Scott Arfield's strike against Chelsea remains their only goal and unless that improves, it could be a very long season for the Clarets." We'll bring you some reaction from the Madjeski shortly, but let's begin to build towards the afternoon's Premier League offering. Former Wolves and Reading midfielder Mick Gooding on BBC Radio Berkshire: "What with Wolves' goals against and goals scored I don't think anyone would have predicted a 3-3. "Kenny Jackett will be delighted his team has scored three, but at 3-2 up Wolves had a short corner and got it wrong. They were trying to play the clock down but within a minute Reading had gone down the other end and scored the equaliser. They should have gone for the fourth because they were in the ascendancy. But it was a great game of football." A fair result? Just about... Wolves shaded possession with 53% but Reading had more shots on goal - 13 to the visitors' 10. A six-goal thriller comes to an end. Wolves miss the chance to draw level with Norwich at the top of the Championship, but they are still third. Reading are into 11th. Reading's Nick Blackman also has a chance to rifle home a free-kick from 45 yards, and he fires into the stands. Nappier O George: Tom Cruise of Arsenal's youth team? Cruise, 23, is now playing for Torquay United in the Football Conference. Bakary Sako stands over a free-kick 45 yards from goal, but the shot is straight into the two-man wall. Five minutes of time added on for either side to find a winner. Alex: A front two of former US president/Crystal Palace striker Andrew Johnson and The Doctor/Fulham's Matt Smith? Former Wolves and Reading midfielder Mick Gooding on BBC Radio Berkshire: "Fantastic strike from Glenn Murray, but it has taken a wicked deflection. Whether it was going in I don't know, but it does not matter. What a game." This game has had it all - the icing on the cake an 89th-minute rasper into the top corner which could save a point for Reading. Jamie Mackie holds off his marker and lays the ball into the path of Glenn Murray who lets fly and watches the ball ripple the net via a deflection. Top drawer. Former Wolves and Reading midfielder Mick Gooding on BBC Radio Berkshire: "There is no doubt about the decision. It was a really good corner, Oliver Norwood tried to clear it but he cleared it from a yard over the line. "Reading have got just over five minutes to go to get an equaliser. But they haven't created too many opportunities so far this afternoon." Have Wolves found themselves a winner? Bakary Sako's corner is glanced just over the line from six yards out - we initially thought it was Wolves' Dave Edwardsbut it's actually Reading's Nick Blackman with an own goal. I say just because the ball was cleared - but only after it had crossed the whitewash. A top decision from the linesman. Former Wolves and Reading midfielder Mick Gooding on BBC Radio Berkshire: "The game has gone a bit flat. There have been a few changes made by both sides, and that has definitely affected the flow of the game." Alistair Coleman: A pal took me to see Newport when they had a defensive partnership of John Lewis and Mark Spencer. Famous names indeed. The crowd becomes vocal as we tick into the final 10 minutes - Jordan Obita disappointingly dragging wide after good forward hold-up play from Nick Blackman. Another change... the goalscorer James Henry coming off to be replaced by Rajiv van La Parra. Wolves shake it up again - sending on Dave Edwards for George Saville. Reading are on the front foot now and Glenn Murray's shot is deflected into the direction of Scott Golbourne, who chests clear in the area. Those of a Reading persuasion scream for a penalty, but replays show the referee got the decision spot on. Another promising Wolves move ends with the linesman's flag when James Henry's searching ball from deep is met by Lee Evans but the midfielder is penalised for climbing all over his marker. Simon Cox can give his rugby boots (63 mins) a rest now, the Reading striker being replaced by Jamie Mackie. Danny Guthrie brings down a marauding Lee Evans in full-flight and goes into the book. That presents Wolves with a good set-piece opportunity, which sees James Henry whip the ball to the back stick where Leon Clarke glances a header wide. Moments later, Richard Stearman is booked for an off-the-ball push on Glenn Murray. It seems to be Wolves, with a more direct approach, who are bossing this game - but Reading appear cute on the counter. This is anyone's game. Jordan Obita makes up for his earlier mistake with a superb block on the line under pressure from Leon Clarke, after the ball had been pumped into the box from the left wing. Former Wolves and Reading midfielder Mick Gooding on BBC Radio Berkshire: "Well, most people today thought it would be 1-0 either way, but this is a feast of goals! "For Wolves, it looked as if Jordan Obita had the ball under control but he turned back to his own goal and kicked it straight to Lee Evans, who buried it. "Then for the Reading goal Simon Cox laid a lovely little pass onto Jake Taylor, who had an easy little finish. Well he made it look easy - he just rolled it past the keeper. But there was lovely weight on the pass from Cox. Taylor didn't have to break stride. What a game we have got now." Who needs the Ryder Cup? This game has everything now - Jake Taylor equalising within a minute for Reading after being played in on goal by Simon Cox. What a turnaround... a mistake by Jordan Obita sees the Reading winger inexplicably pass to Lee Evans inside his own area and the Wolves midfielder makes no mistake and buries the gift-wrapped chance. Former Wolves and Reading midfielder Mick Gooding on BBC Radio Berkshire: "James Henry has got great quality, he didn't see the cross till late but rocketed it in off the side of his foot. The cross from Bakary Sako came through a crowd of Reading players. Sako has been the only dangerous player for Wolves so far for me." Against the run of play, Wolves drag themselves back into this game courtesy of former Reading midfielder James Henry. The Royals give the ball away in midfield, Bakary Sako charges down the left and plays a delightful ball into the box for Henry to tap home from six yards. Reading are pressing Wolves back and a mis-placed pass gifts possession to Oliver Norwood who has all the time in the world to rifle a dipping shot just over the crossbar. Reading's half-time sub Danny Guthrie is a lucky boy, escaping without even a yellow card for a wild lunge on Wolves midfielder James Henry. That was a proper reducer. Half-time brews supped. Biscuits munched. It's time for the second half at the Madejski Stadium. A half-time change to tell you about... Danny Guthrie comes on for Hope Akpan for Reading. Former Wolves and Reading midfielder Mick Gooding on BBC Radio Berkshire: "Wolves started brightly but since the Reading goal they haven't created anything. "Their tempo changed, they became erratic, and there is more pressure on them to create something. Reading have been on top and look the more likely to score the second goal." Reading are very much in control of this one, thanks to Michael Hector's first-half goal. Bakary Sako bursts into life down the Wolves left, but his cross is too close to the keeper and Adam Federici easily gathers. Moments later, Reading's Jake Taylor goes into the book for a rash challenge. Almost half-time now. Two furry Reading mascots sit on the concrete floor behind the corner flag as Wolves get a chance to pump a ball into the box, but it's cleared by the home defence and Kevin McDonald's follow-up from 35 yards heads for Row Z. Former Wolves and Reading midfielder Mick Gooding on BBC Radio Berkshire: "It is beginning to get more comfortable for Reading. Wolves are not looking threatening going forward, and Reading are having a good spell of possession. Wolves started off really confidently but now they keep giving it back to Reading, who are definitely growing in this game." Bright build-up from Reading, with a poor finishing touch. Jordan Obita jinks into the Wolves penalty area for the first time in the game and he pulls the ball back across goal but Hope Akpan toe-pokes his effort straight at the goalkeeper. Jamaica manager Winfried Schafer has swapped the Caribbean beaches for Berkshire this afternoon, and he'll be pleased to see Reading defender Michael Hector on the scoresheet. Could a first call-up be in the offing for the 22-year-old? Kevin McDonald is beginning to influence play for Wolves, but his cross into the box is eventually cleared after a spot of headed pinball. The visitors are becoming more and more direct as this contest unfolds. In the spirit of physio-turned-manager Nigel Adkins, we want to hear your unlikeliest sporting heroes. Nutmeg Larry: Jose Mourinho, from unknown translator to master tactician. Former Wolves and Reading midfielder Mick Gooding on BBC Radio Berkshire: "It was a good move from Wolves and it was a very close offside decision. Leon Clarke missed it anyway so there was no controversy." Wolves rally and Leon Clarke gets on the end of Kevin McDonald's excellent pass but his shot rolls just wide of the post. It didn't matter anyway... the linesman's flag was up. Jacob South-Klein: Let's not forget Brian McDermott - club scout turned Championship-winning manager. Glenn Murray lashes a shot wide from 25 yards, with Simon Cox imploring his strike-partner to play a slide-rule pass. I don't mind that... a proper striker has to be decisive, which is what Murray was. It didn't work this time, but he's just sharpening his radar. Adam Zuyderwijk: Louis van Gaal. The Gymnastic Teacher/ semi-pro midfielder who became one of the best football managers! Just before the goal went in, Wolves manager Kenny Jackett was seen scribbling notes down in his technical area. He's using one of those pencils with a rubber on the end. Perhaps, he needs to erase some of his best-laid plans and revert to Plan B now. Former Wolves and Reading midfielder Mick Gooding on BBC Radio Berkshire: "It was a great header by Michael Hector. After a great ball to the near post, Hector got across his man and really thumped his header home. "Wolves have only conceded four goals this season and are obviously not happy about it when they do. The good thing for Reading is that Wolves don't score many goals." It's been coming... Reading take the lead via a short corner which ends with Oliver Norwood putting in a perfect ball and Michael Hector nips in front of his marker, Richard Stearman, to head home from six yards out. Simon Scott Daniels: Both Tom Whittaker and Bertie Mee were physios at Arsenal before being manager. Both won league and FA Cup as boss. David Doran: Eric Spolstra of the Miami Heat. Went from video coordinator to NBA champion coach. Indeed, Reading are starting to flex their muscles and Simon Cox should do better when he steers a header wide from 12 yards before, in the very next move, Glenn Murray hammers an angled shot wide. Former Wolves and Reading midfielder Mick Gooding on BBC Radio Berkshire: "The past five minutes has definitely been Reading's best spell. Nigel Adkins has come down pitch-side to clap his team, encouraging to keep passing the ball." Jake Taylor is looking lively down the Reading left, but his slaloming run towards goals comes to an abrupt end when he runs down a cul-de-sac. Max Bell: Definitely Nigel Adkins. As a Scunthorpe fan, we were where it all started and we truly had our best times under him! Kieran O'Brien: Roy Essendoh for Wycombe Wanderers in the FA Cup. Reading goalkeeper Adam Federici is wearing an electric pink goalkeeping kit today - the type of colour which wouldn't look out of place at a foam party in the local nightclub. It's eye-watering.